BENZA Taekwondo Karate Sparring Gear Package includes, Super Light Kicks /Shoe / boot, glove pair, head guard and mouth piece. Boot, 1/2″ foam provides coverage for instep and ankle. Open bottom helps prevent slippage. Vinyl strip across ball of foot, along with hook and loop closure around ankle ensures a good fit. Top ventilation for added comfort. Unique crescent moon cutout at Achilles for better flexibility. Glove, 1/2″ foam provides coverage for wrist, back of hand, thumb and knuckles. Finger slots and strap across back of hand helps to perfect good punching technique. Special double foam coverage located over knuckles. Hook and loop closure around wrist for proper fit. Unique crescent moon cutouts enable better flexibility at wrist. 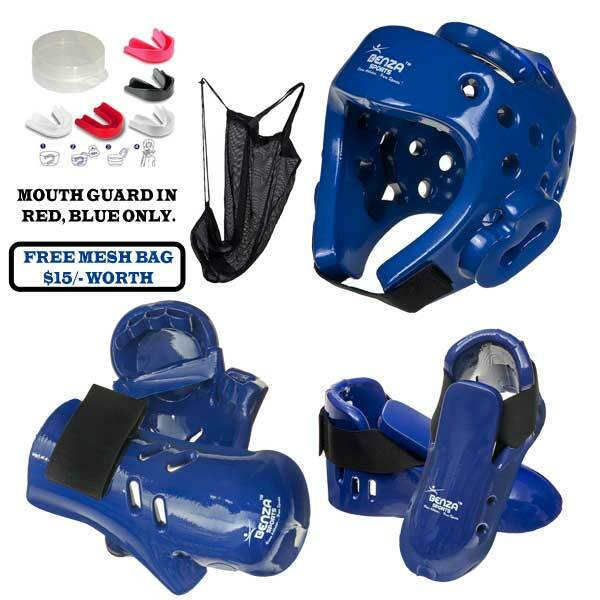 Head Guard, 7/8″ foam provides coverage for top, back and sides of head, plus forehead. Well ventilated on top, sides and back. Hook and loop closure chin strap. 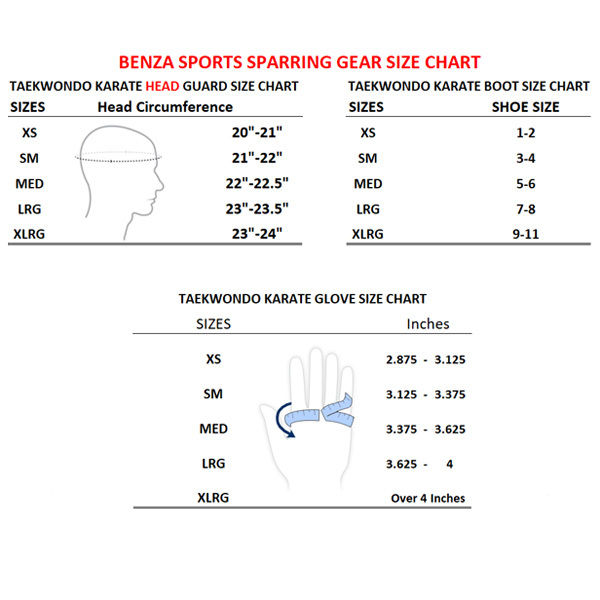 PLEASE TRY OUR BEST QUALITY ALONG WITH COMPETITIVE PRICE AVAILABLE IN MARKET FOR BENZA KARATE TAEKWONDO SPARRING GEAR SETS. PLEASE NOTE RED, BLUE AND BLACK SPORTS BAGS ARE ON BACK ORDER. YOU WILL MESH BAG ONLY.